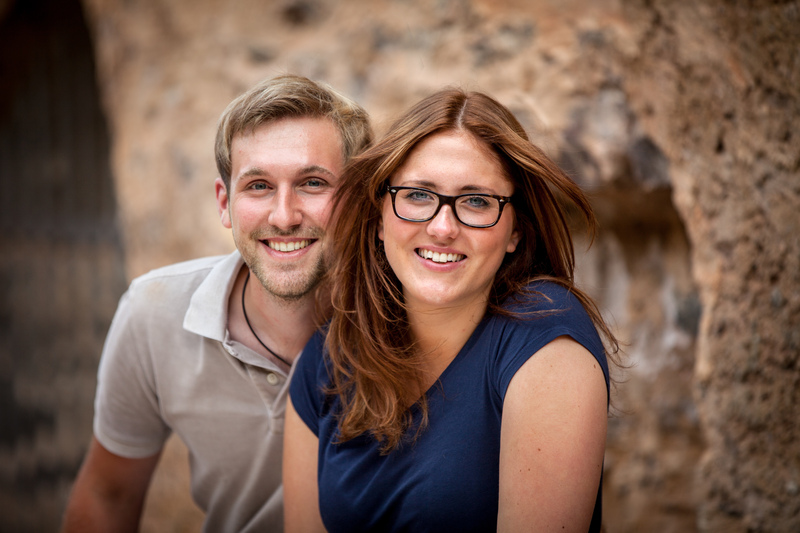 Angelina and Kilian Franzen’s story is every bit as moving as their wines. It begins in the Mosel’s Bremmer Calmont. After millennia of cultivation, these sheer vertical vineyards — among the world’s steepest — had, by the 1980s, been abandoned. One wine grower embraced the daunting prospect of recultivation: Ulrich Franzen. “His vision was to bring the Mosel Terraces, especially the Bremmer Calmont, back to where it once was: at the top of German wines,” explains his son, Kilian. Tragically, in the middle of this heroic project, Ulrich lost his life. Kilian and his future wife, Angelina, then still students, returned home to take over the estate. Today, the Franzens have 5 hectares in the Calmont and holdings in the venerated Neefer Frauenberg and Kloster Stuben vineyards nearby. The focus is, naturally, riesling, with small plantings of elbling and pinot varieties. Vines are up to 90 years old, their roots driven into the terraced slate, giving immense concentration to the wines. Perhaps because so much has been forced in the vineyards and in the Franzens’ young lives, nothing is in the cellar. Fermentations are spontaneous, some taking nearly two years to complete. The wines go through malo and GGs are bottled late. All this accounts for wines that are as much about texture, herbaceousness, and salinity as they are fruit. They display remarkable freshness and animation as well as power and echoing length. Because so little wine is made from the Calmont, the wines have largely remained a secret, even among riesling connoisseurs. Through pure dedication and heart, the Franzens have made it the source for some of the most arresting wines in all the Mosel. Wine growing in the Mosel valley dates to around 280 AD, when Roman Emperor Marcus Aurelius Probus lifted the ban on cultivation outside what is now Italy, and cultivation spread throughout the Rhine and the Mosel. The Mosel Terraces form a unique landscape, very different from that of the more famous Middle Mosel. Topography and soils are paramount here. The microclimate is warmer, the vineyards more vertiginous, and viticulture more difficult here. The hand-built terraces that give the region its name have always been essential to enabling vines to grow in the cold macroclimate and steep terrain. Even the Romans called the Bremmer Calmont mons calidus, hot mountain. By the 19th century, the Calmont’s suitability to riesling had become obvious: the entire mountainside was planted to riesling. The upper portion, known as the Fachkaul, was awarded the highest classification on tax maps of the time. Yet after WWII, lack of manpower and will to meet the intensive demands of the vineyards led to abandonment of these parcels, one by one. By the 1980s, the mountain was covered in roses and wild vines; only the parcels along the road and river remained under cultivation. The Franzen family has been rooted in Bremm for centuries. Kilian’s grandparents had parcels in the Calmont. Kilian says it was always the dream of his father, Ulrich, to have productive vines up there again. “When my father took over operations from my grandparents in the early ‘80s, he changed the orientation of the estate and put the emphasis on the production of dry, lower-acid wines. Beyond that, the preservation of the steep sites was dearest to his heart.” In 1999, Ulrich resolved to buy all the contiguous Calmont plots he could. Napoleonic law had long since splintered the vineyards into tiny parcels, all with different owners. The only way to find out who owned what was to comb through town records. It took Ulrich three years to track down 112 different owners — from Australia to China to the U.S. — and purchase their plots. This enormous effort yielded a glorious prize: the steepest parcels, united in a magnificent, south-facing amphitheater in the very heart of the Calmont. Painstakingly, Ulrich and a small team cleared and replanted the vineyards, all by hand. 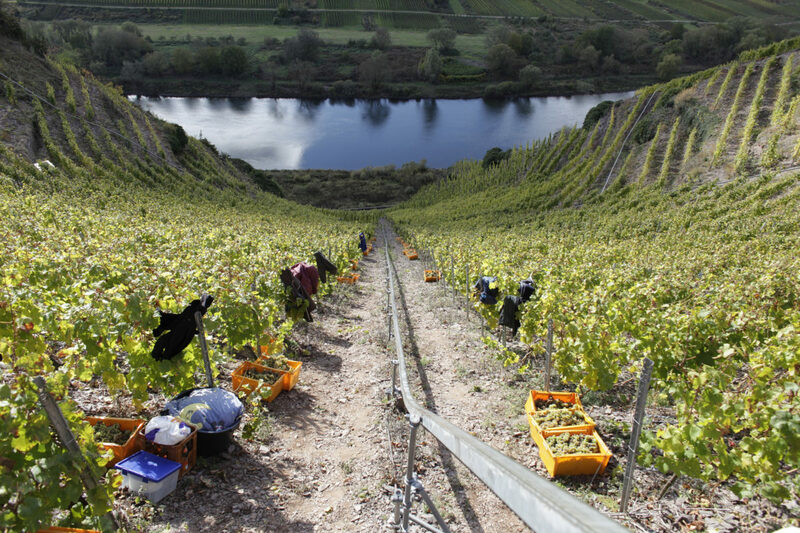 Within three years, they had anchored nearly 8,000 riesling vines in the obstinate slopes. The only concession to mechanization was the installation and operation of vineyard monorail lines — 500 meters of track ascending from the Mosel’s edge to the top of the Fachkaul. Little by little, Kilian says, “We learned and we grew in our tasks. We exchanged views with many winegrower colleagues. No matter if Reinhard Löwenstein, Clemens Busch, Johannes Leitz, Julia Bertram or Benedikt Baltes. Everyone stood by us in word and deed.” They have now made Franzen truly their own — though they are the first to give credit to everyone else. Bremm sits about midway between Bernkastel and Winningen, at a point where the Mosel pulls into a tight bend and the Calmont rises imperiously above its north bank. The Calmont itself stretches some 2 kilometers (1.2 miles), forming what is essentially an enormous concave mirror, open to the south. The mountain rises some 400 meters (1,300 feet) above sea level, and its summit, covered in trees and shrubs, shelters the valley from northern winds and cold. To stand at the Mosel’s edge and look up at the Calmont, the cliff appears “almost threatening,” Kilian acknowledges. “Many passages, even steeper than 65 degrees, rise almost vertically. The steepness can only be grasped once you climb into its terraces. There is no single contained vineyard, but rather sections of earth, intermingled with steep rock walls and rough ledges. To make the cliff useful for cultivation, growers built terraces with support walls. However, these walls, unable to withstand the pressure of the mountain for long, collapse, and must be constantly repaired or rebuilt.” The terraces are also essential for retaining the sun’s warmth to moderate diurnal shifts and for guiding the vines’ root systems into the slope. The Franzens’ vineyards are concentrated in the Calmont, with additional holdings in the Neefer Frauenberg and Kloster Stuben just opposite. The Frauenberg and Kloster Stuben (the former Augustine monastery that thrived here for six centuries before secularization) are sited on a hilly peninsula formed by the Mosel’s hairpin bend, offering a second, though less dramatic, bank of south-facing vineyards. “We now have a little more than 10 hectares in total — about 5 just in the Bremmer Calmont. The largest single parcel is the Fachkaul, with its now 1.8 hectares. Bremmer Calmont has about 12 hectares in cultivation. The remaining seven hectares are shared by about 20 other winemakers,” Kilian notes. By comparison, the Frauenberg has more weathered gray slate, with more humus and smaller rock fractions, making the Frauenberg wines, as Kilian sees it, “finer, with slightly more fruit and finesse.” This is also where the Franzens have their oldest vines, ranging from 60 to 90 years old. For the estate wines, such as Quarzit Schiefer, Kilian “likes to take the vineyards from the part of the Calmont exposed a bit east. The wines are a bit clearer, a little less complicated, and a bit easier to drink.” Kloster Stuben is a lower, sandier site, well suited to the earlier-ripening traditional variety of the Lower Mosel: age-old elbling. “When we took over the winery, we wanted to do everything differently. We saw only what we had newly learned at Geisenheim and wanted to upset everything. We had to realize that much of what was old was good. We did not stick to old data for the perfect reading time, but turned to the grapes. We reap maturity rather than time. We want lighter, clearer wines that retain their character, not feel heavy. The wines should decide in which direction they develop — not us,” notes Kilian. The wines are nearly always dry. But, Kilian explains, “Every year, one tank takes forever, and what can we do? We wait and wait and if it doesn’t get dry, it must be where the wine wants to be.” In 2015, they decided to start bottling the results as “Zeit” (“time,” in English). Though extraordinary today, the wine harkens to a time when this kind of élevage was normal. The 2016 version fermented for more than 400 days. A key element to this overall approach is allowing the wines to go through malolactic fermentation as well. In fact, malo can and does. It is part of some producers’ expression of terroir and can contribute a rounder acid profile and richer texture to riesling. It’s also quite possible that malo occurs in riesling far more often than we or even the winemakers — not all of whom control for malo — know. Malo is not a true fermentation at all, but a bacterial conversion of malic acid to lactic acid. The lactic acid bacteria are typically on the grapes when they come into the cellar from the vineyard. But, as in the Franzens’ case, they can also be in the cellar. Primary alcoholic fermentation and the addition of SO2 at crushing significantly reduce the bacteria population. But by spring following harvest, nutrient and free SO2 levels typically have tipped back in favor of the resurgent bacteria, just as cellar temperatures begin to climb to a hospitable degree, allowing malo to occur. There is much more at play than pH alone: Temperature and rate of fermentation. Timing of malo relative to primary alcoholic fermentation. Lees exposure. Early versus late bottling. And of course, timing and levels of SO2 additions. These factors can partially or fully block malo or alter the perceptible sensory effects of malo on the wine. In discussions of malo in riesling, most consideration is given to its effects on acidity. According to research reported by Jamie Goode, malo increases pH by 0.1 to 0.3 units and reduces total acidity by 1 to 3 grams per liter. There are also concerns that it may add nutty or buttery aromas. But when managed correctly, malo can offer a desirable roundness of acidity and textural complexity. And malo’s characteristic aroma and flavor impacts, it turns out, can be absorbed by the lees, given adequate exposure. There is debate as to whether malo belongs to the historical style of the Mosel. Some argue that up until the 1890s, this was the norm for the dry wines. Others contend acidity levels of the time would have made this impossible. What matters to the Franzens is that malo is inherent to their terroir and style. They wouldn’t have it any other way. On April 20th, 2017, it looked like our entire harvest would be destroyed by a late frost that was terribly destructive. As expected, we lost a third of our yield and the vineyards that did remain intact grew unevenly, which made for extensive canopy work. Luckily, the grapes that made it to harvest had wonderful concentration and were very aromatic and ripe. As a result, grapes reached their physiological ripeness earlier than usual and all wines were fermenting by early October. Spring was very rainy, and we had more water than we needed. Therefore, of course, we struggled with an enormous amount of disease pressure which increased the work-load in the vineyards. We pruned the grapes, removing compact sections of the clusters, so the fruit could easily aerate and avoid fungus and rot. Luckily, summer weather was warm and dry, followed by a cool and dry autumn. The grapes had no trouble ripening and harvest was rather relaxed. After a couple of tough years and very stressful vintages , 2015 was a pleasant year for Franzen. The summer was very hot and dry and it wasn’t until September that it finally began to rain. At first, Kilian and Angelina were thankful for the rain but that quickly turned to fear recounting the previous vintage and stress that ensued due to rainfall late in the season (once the berries had matured.) Luckily, the weather in October was good and restored their faith in the vintage. As it turned out, they were able to make several passes through the vineyards and take their time with the top sites. The yield was not huge but 2015 was a very good vintage- fresh and exciting with lots of character and good balance. Slates are debris soils where the landscape is dominated by a grey color of the weathered grey-blue Hunsrueck slates. 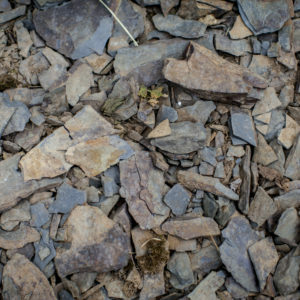 Dark-brown humus rich topsoil is often covered by slate debris and rubble which protects the soil from desiccation. The spaces between the loose materials are therefore well aerated. It is possible to feel loess as well as clay and mineral-rich fine earth derived from weathered slate. The vines are well supplied with minerals such as potassium, magnesium, sodium and iron from the clay fraction. Slate weathers rapidly thus ensuring a continuous supply of nutrients and mirco-nutrients. The Neefer Frauenberg slate is much more weathered than the red slate in the Calmont. Here, there is more humus in the soil and the rocks are smaller. The wines are fruitier and filigreed, straighter and softer, though very expressive and powerful. Here , the soil contains a combination of red clay slate and quartzite. 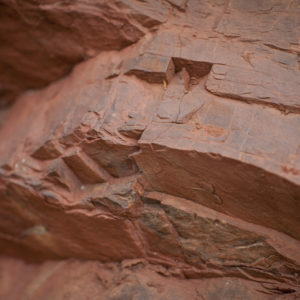 Red slates are soft water sediments; the color comes from the iron content that has oxidized due to its arid climate, resulting in a very rocky, hard soil. It has less minerals than the rich soils of grey slate but still contains more than the quartzite soils. Vines' root systems struggle to penetrate this stony soil in search of water which drains easily; the plants cope with limited water supply by reducing the quantity and overall size of the grapes which results in low yields and highly concentrated berries. The wines are very powerful, spicy and full of saltiness.